In this issue, as we face a well-deserved spring, I feature recipes that always delight guests with the simple complexity of ingredients that strategically play off one another in terms of flavours, textures and even colours. The appetizer and dessert recipes can also be modified to become cocktail party favourites. 2. To present as free-standing timbales, use a cylinder (2 inches or 6 cm in diameter) to assist in the construction. For individual servings, place a cylinder in the centre of a luncheon plate or a wide-rimmed soup dish, add 1/3 tsp (2 mL) of Tarragon Hollandaise Mayonnaise, then 2 tbsp (30 mL) of avocado cubes, pressing avocado down gently into the bottom of the cylinder. Drizzle avocado with about 3/4 tsp (4 mL) of Tarragon Hollandaise Mayonnaise. Repeat the procedure adding the same amounts of diced avocado and Tarragon Hollandaise Mayonnaise drizzle. 3. Top each serving with one quarter of the Macadamia Aioli Shrimp Topping (about 3 tbsp or 45 mL). 4. 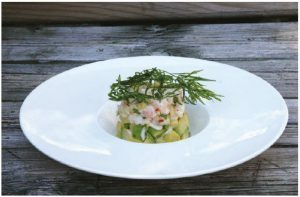 Garnish the timbales artistically with fresh herbs (or deep-fried sprigs of fresh tarragon) and if desired, plates/soup dishes with drizzles of Tarragon Hollandaise Mayonnaise. * To make 1/3 cup (80 mL) of Tarragon Hollandaise Mayonnaise, combine 1/3 cup (80 mL) of mayonnaise, 3/4 tsp (4 mL) of prepared mustard (French’s for example) and a pinch of crushed dried tarragon leaves. My husband used to say that this recipe was awesome. It is quick and easy to prepare while offering unusually exciting flavours. Think of ground cinnamon and grated fresh gingerroot rapidly seared with delicate haddock fillets. 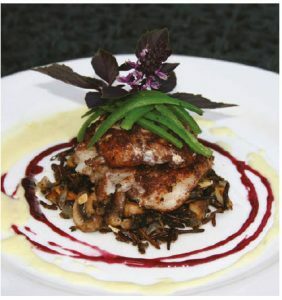 An accompanying White Wine Cream Sauce punctuated with drizzles of blackberry jam makes this dish a culinary experience not to be missed. To contribute to the wow factor, try serving the fillets on a cushion of mushroom wild rice and crown the fillets with frenched green beans bathed lightly with sesame oil. Note: Previously frozen fillets, which are less expensive, work well. 1. Rub all surfaces of fillets with gingerroot, sprinkle with cinnamon and season with salt. 2. Heat oil in 2 large non-stick skillets over medium-high heat. Add fish. Keep moving fillets and cook until first side is crisp (about 1-2 minutes). Carefully turn fillets over and reduce heat to low. Continue cooking second side and moving fillets until flesh flakes and just turns opaque — another 1 to 2 minutes or so. Transfer immediately to platter or individual plates. 3. Serve promptly with White Wine Cream Sauce and drizzles of sieved blackberry jam. 1. Dissolve chicken bouillon powder and mustard in hot water. 2. In a small saucepan, sauté garlic and ginger in melted butter over medium heat for about a minute; blend in flour and cook for another minute. Whisking constantly, add bouillon mixture and wine; whisk until smooth. 3. Reduce heat to medium-low; continuing to whisk constantly, add cream and bring sauce to a simmer. Allow sauce to simmer gently for a couple of minutes; remove from heat and, if desired, stir in cognac. The sauce may be stored refrigerated for up to 3 days or frozen for months. With its additions of garlic, ginger and crunchy almonds, this recipe gives a broader dimension of flavours and textures to the typical stellar combination of wild rice and mushrooms and it’s a perfect accompaniment for virtually everything — seafood, fish, game, beef, poultry and pork. 1. In a large skillet over medium-low heat, sauté garlic and ginger in hot butter for about 1 minute. Add shallots and sauté carefully until transparent. 2. Add mushrooms, seasoning with salt and crushed black peppercorns; sauté over medium-high heat until just tender and slightly browned. Remove from heat. 3. Shortly before serving, heat mushroom mixture over medium-low heat. Stir in cooked wild rice; combine thoroughly and heat through, adding a few drops of water to keep mixture slightly moist. If necessary, adjust flavours by adding a touch of butter or garlic butter, salt and crushed black peppercorns. Cover and remove from heat immediately. 4. Stir in toasted almonds and serve. 1. Rinse wild rice thoroughly. Place rice, water and garlic in a small saucepan over high heat; bring to a boil. Cover saucepan tightly and reduce heat to low. 2. Cook until grains are tender (about 40 to 45 minutes for very long-grain, top-quality wild rice). Grains will burst partially open, showing only some of the white interior. Avoid overcooking. During the last couple of minutes of cooking, stir in instant beef bouillon powder and combine well. It may be necessary to add touches of water during the final stages of cooking. Rice can be cooked up to three days before and stored in an airtight plastic container. 3. Remove from heat and drain off any excess liquid. Return wild rice to saucepan, stir in garlic butter. Will chocolate fondue ever lose its popularity? Personally, I am particularly fond of butterscotch. In my determination to offer simple but innovative alternatives to traditional favourites, I have come up with my own Butterscotch Fondue. Guests claim it to be a sensuous experience, while they continue to dip fresh blackberries into a creamy butterscotch sauce with uncontrollable enthusiasm. The stunning balance of tart and sweet mesmerizes absolutely everyone, including children and those who are not dessert fans. 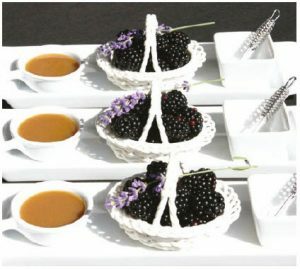 creatively arrange 1/4 of the blackberries and butterscotch sauce in 2 separate small bowls or dishes. Place them on a plate with a cocktail pick (or corn pick). 2. If desired, garnish the plates with a sprig of fresh lavender or mint. 3. Using the cocktail picks, securely pierce berries one at a time and dip into butterscotch sauce. My Dickenson Blackberry Butterscotch Fondue owes its stellar reputation to this sauce. I keep the creamy butterscotch sauce on hand in the refrigerator and freezer ready to play its paramount role in my signature fondue or to be used in tempting dessert, pancake or waffle presentations. 1. In a medium-sized saucepan, melt butter over medium heat. Stir in 3/4 cup (180 mL) of heavy cream and bring to a boil. 2. Add remaining cream and brown sugar; stir constantly until sugar dissolves and mixture comes to a boil. 3. Reduce heat and allow sauce to boil fairly vigorously over low heat (uncovered) for about 8 minutes without stirring. To test for consistency, drop a touch of sauce into a little cold water. It should not disperse. Remove from heat. Whisk well. 4. With a clean damp cloth, thoroughly wipe exposed surfaces of saucepan above sauce to remove any lingering sugar crystals. This assists in preventing crystallization during storage. 5. Set aside until cool. 6. Stir sauce extremely well and transfer to airtight plastic containers. Avoid scraping “clean” inside surfaces of saucepan as sugar crystals may be present. 7. Refrigerate to thicken and until ready to use. 8. Serve this Creamy Butterscotch Dessert Sauce chilled from the refrigerator, at room temperature or warm. Stir well before serving. The sauce may be stored refrigerated for up to several weeks or frozen for months.